Note: you will need administrator level access to add a user. TIP! 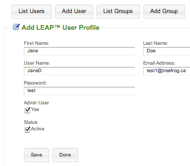 the LEAP™5 Lite version comes with only one user. To expand your website management empire, upgrade to LEAP™5 Professional, or LEAP™5 Enterprise. TIP! You cannot delete all Admin Users and you cannot delete yourself. If you are moving on, pass the Admin rights to someone else and let them do the clean up.